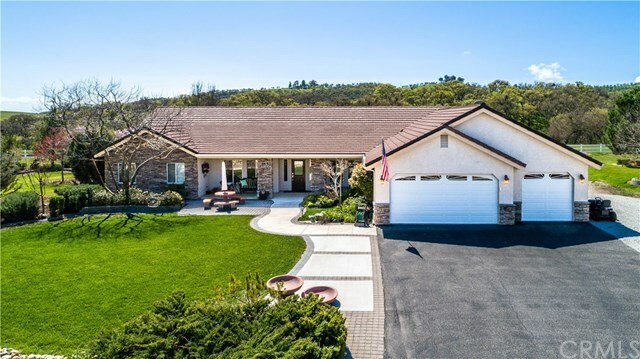 Country living at its finest, yet only a few minutes to downtown Paso Robles and easy access to Award winning local Wineries! Beautiful single level gated Rancho Salinas home on 2+ acres. The home features 3 roomy bedrooms plus office with 3 full baths in over 3000 sq ft of living space. Beautiful tile floors welcome you as you enter the open living room then accented with hard wood floors on both sides; Master bedroom, kitchen and Family room. The exquisitely designed Master suite includes granite Fire place with raised hearth, his and her walk in closets as well as oversize walk in tiled shower, jetted spa tub and separate dual sinks. Enjoy relaxing in the family room near the fireplace after a nice dinner prepared in the spacious kitchen with walk in pantry. The formal dining room is comfortable for all family meals. Low maintenance yard and landscaping. The meandering driveway leads to the 3 car garage with new epoxy flooring. All this in a fenced, quiet, neighborhood community, nestled up against Oak studded pastures . Bring the family,pets,animals etc for luxurious, stress free country living!